Hey Jeff, do you think that you could “part out” the robot body (ie separate the parts into separate arms, legs, etc) that is included under the body>malestandard set? I know many of the parts are elsewhere, but it’s hard to make a robot arm without the elbow section, the main thing I’d like. Not a bad idea, TG. I concur WTF. I mean…the picture and the words go together to well. It has to be intentional. The guy’s face… the up and down movement.. you’re sure you didn’t draw this one yourself as a joke Jeff??? I definitely didn’t alter it at all, but I don’t have the original issue myself — it’s from more complete page scan on another guy’s blog. So I suppose he could have faked it but I don’t think so. 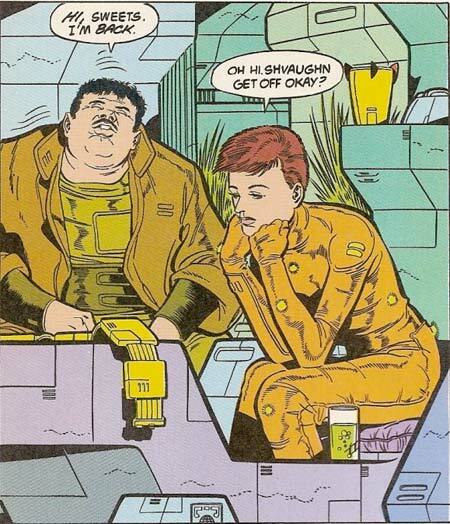 It is definitely Giffen’s artwork and I think what’s happening is that Bouncing Boy’s fixing up a Legion flight belt for her. Of course I immediately took it the wrong way and took out the exculpatory next panel because I have the sense of humor of a twelve year old. On another note, and please feel free to chastise me for not coming up with this idea earlier but… I was playing with HM3 and trying to get different looks for faces and it occurred to me that it would be better if you just had the outline of the eyes and maybe two pupils… that way we could move the pupils up and down left and right (like the character was looking at a certain spot) and you wouldn’t have to draw them all… just make more outlines like mad, sad, etc…. Damn, that’s a good idea, Worf! I might just add those in tomorrow morning, that would be really neat … I already have those three or four blank eyes at the end, meant for the glow-eye effect. Putting in a couple of pupils and irises should be no problem. You could mask them onto the blank eyes if you want to keep the round orbs from showing over the lids. Good idea, thanks for sharing it! No, wait, I think what’s happening is that he’s sitting down (he’s Bouncy, remember?!) and she’s asking him if the Science Police officer assigned to the Legion — Shvaughn — got onto her departing flight ok. I think that’s supposed to be relief at finally plunking his bouncy buns onto a chair after being on his feet too long. At least I sure HOPE that’s what’s going on. The first few times I read it through I thought HE was Shvaughn, but now it’s all coming back to me.